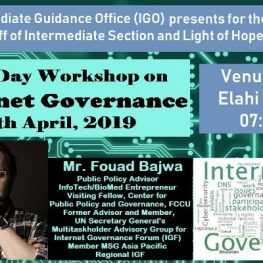 The Intermediate Guidance Office (IGO) will be organizing a One-Day Workshop on Internet Governance for the Faculty of Intermediate and Light of Hope School on April 6, 2019 (Saturday) at 7:30 am in E-038. Through the workshop the capacity building of the participants for understanding the evolving policies and mechanisms under which the internet community’s many stakeholders make decisions about the development and use of internet, is intended. Internet Governance covers a wide range of issues, from day-to-day social, operational and technical workings of the internet to public policy issues such as youth, human rights, freedom of expression, imparting education, reducing poverty, countering violence, gender issues, combating crime and host of other issues on the internet. The resource person Mr. Fouad Bajwa is a Public Policy Advisor and InfoTech / BioMed Entrepreneur, Visiting Fellow at Centre for Public Policy and Governance (FCCU), Former Advisor and Member of the United Nations Secretary General’s Multistakeholder Advisory Group for Internet Governance Forum (IGF) and member of MSG Asia Pacific Regional IGF.